From tutors who work one-on-one with our students, to those who support our events and fundraising activities, we're grateful for the generosity, dedication, and commitment of all our volunteers. 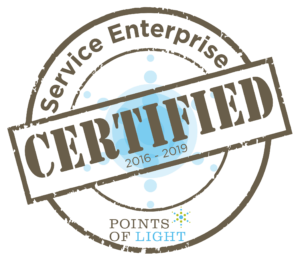 As a certified Service Enterprise, our volunteer program is comprised of a diverse group of respected and engaged volunteers who increase our capacity to fulfill our mission with their gift of service. For more information about volunteer opportunities, call us at (414) 344-5878 or email volunteer@literacyservices.org. Join a team of more than 500 talented volunteers who work along with our dedicated staff to serve nearly 1,000 students each year. Volunteers are matched with students across all programs and receive the necessary training to be successful tutors. We ask that our volunteer tutors commit to tutoring for at least one 90-minute session a week for a period of 6 months. All volunteer tutors must be at least 18 years old and have a high school diploma. Click to learn more. When John Shefchik was still working at Briggs and Stratton, a coworker and former LSW board member, Joyce Mielke, would encourage him to consider tutoring at LSW. John would always respond with, “When I retire.” When he eventually did retire, he followed through by joining Literacy Services of Wisconsin as a volunteer tutor in the GED program. That was over 8 years ago. John has since developed into a highly requested tutor, capable in any subject area. His engagement with students is characterized by warmth and great emotional intelligence. Beyond tutoring, John’s commitment to support LSW’s mission has led to his work in curriculum development/organization, data/admin support, and providing/supporting training for other volunteers. He spends more than nine hours per week volunteering at LSW. John’s hallmark is his inclination to step forward where there is need and without knowing exactly how, in the moment, he’ll do it, volunteer himself to the work at hand. His mantra is a question: “What do you need me to do?” John’s service is an example that represents some of the best of what we can be. LSW has a team of volunteers that work on and support events, projects, and fundraising activities. To apply for the opportunities below or to inquire about other opportunities, please fill out our Volunteer Inquiry Form. Front Desk Support volunteers assist the organization and staff in communicating with incoming students, donors, and other guests and callers to fulfill their requests, as well as maintain respectful confidentiality of personal information. We are looking for someone to fill in on Fridays from 8:30am-12:30pm and someone for evenings, Monday to Thursday, 4:00pm-7:00pm. The commitment can be short term or ongoing. Volunteers can support LSW by assisting with book drives and book collection. LSW collects books year-round for student instruction, online fundraising, and to give away. Volunteers can help by picking up books from individual donors, soliciting businesses to host book drives, and by sorting donated books.